This jumbo kitchen gadget compilation has all the latest inspiration you could need, whether you're looking to round out your own collection, decorating a newly remodeled kitchen, or searching for a last-minute housewarming gift or a thoughtful present for a talented chef – there's something here for anybody and everybody. Kitchen tools are always a great and useful investment because everybody eats, after all! 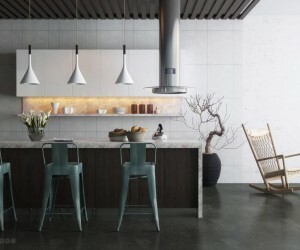 Even for those who don't necessarily enjoy cooking, it's still nicer to spend time in stylish kitchens and it's always easier if you have the tools to make the process as pleasant and enjoyable as possible. 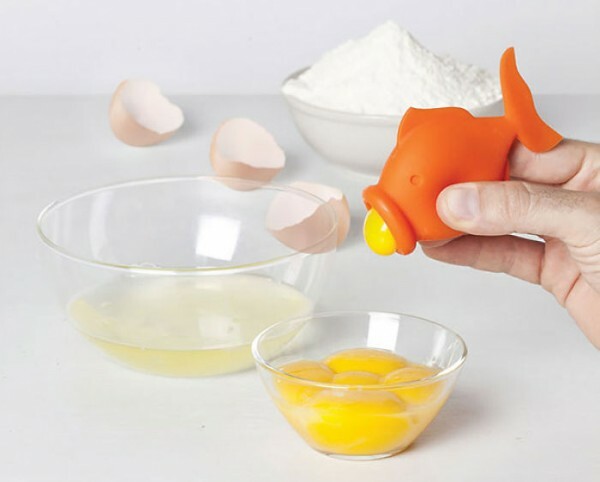 Separate whites and yolks with precision – just crack the egg into a bowl, and use the colorful silicone fish to suction up the yolk. It couldn’t get any easier than that! And this cheerful little guy is much cuter than any of the industrial devices out there. 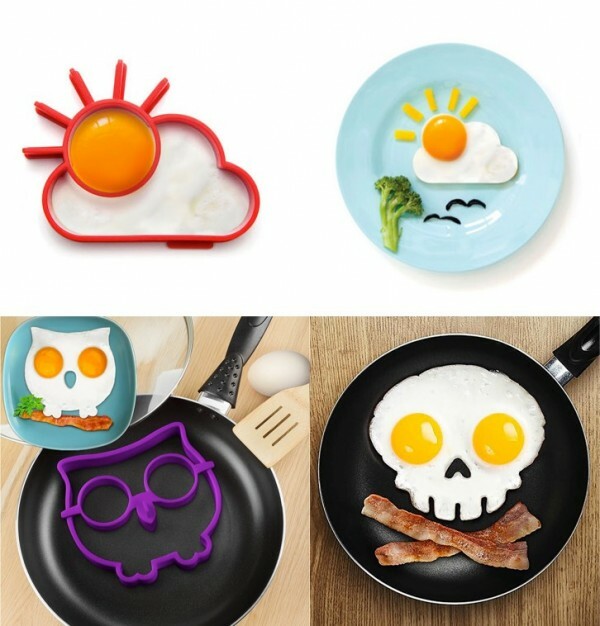 Kids and adults alike can’t resist an adorable stylized breakfast. These egg molds are made of silicone so they won’t scratch the pan, and the flexibility offers an easy release for a neat form every time. If you know any parents caring for picky eaters, this little tool just might make all the difference. They also work for pancakes! 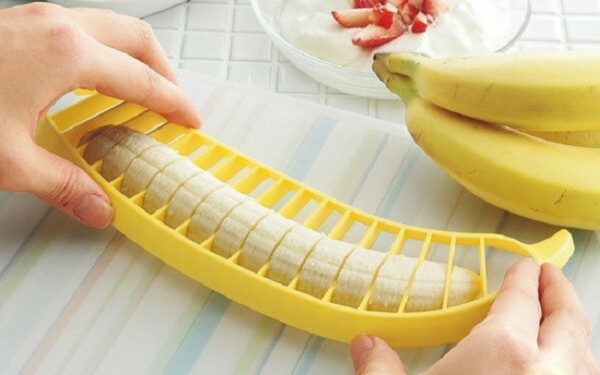 Slice a whole banana at once with this handy banana-shaped slicer! It’s a great way to get kids involved in preparing their own snacks – no knife needed. 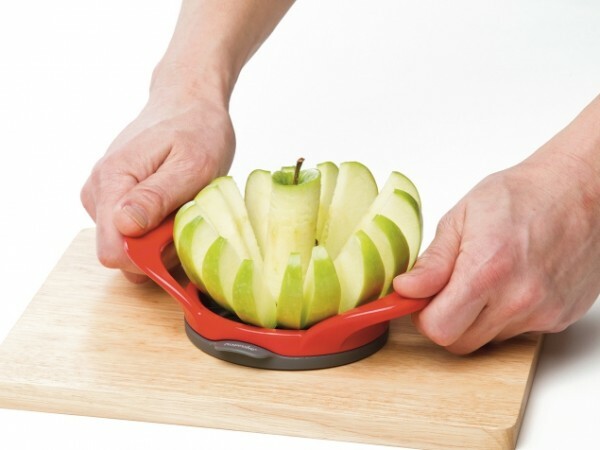 Apple slicers are must-have tools for anyone who likes to snack, dip, bake, and arrange tasty apple snacks. The Calphalon Easy Grip slicer has the added benefit of large sturdy handles for easier slicing, with a raised construction so you don’t rap your knuckles on the cutting board. 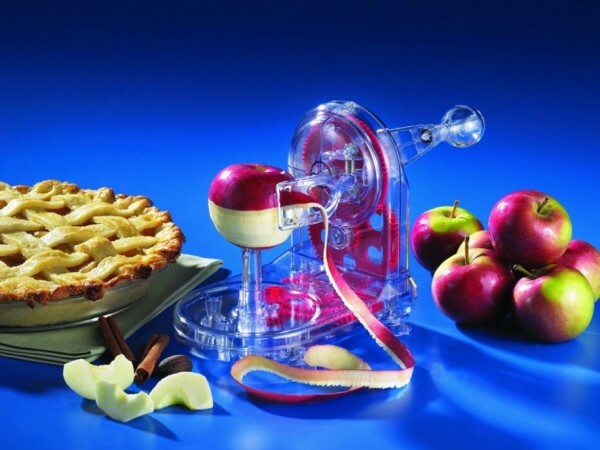 Watch the gears turn as this transparent apple peeler cuts the skin from the apple like a knife through butter. A spring-loaded mechanism fits the shapes of apples of any size. And no engineer or mechanic would be able to resist this gadget as a gift. It’s automatic, adjustable, and comes with built-in storage for the spare blades… what’s not to love? 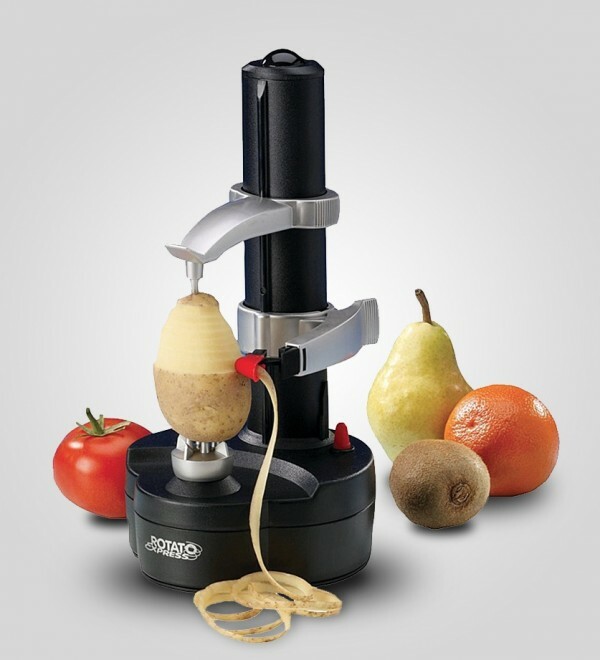 Of course, the Rotato Express does more than just potatoes – the robotic arm adjusts easily to any small to medium sized fruit or vegetable. Spiraling can be a tricky technique to master by hand. 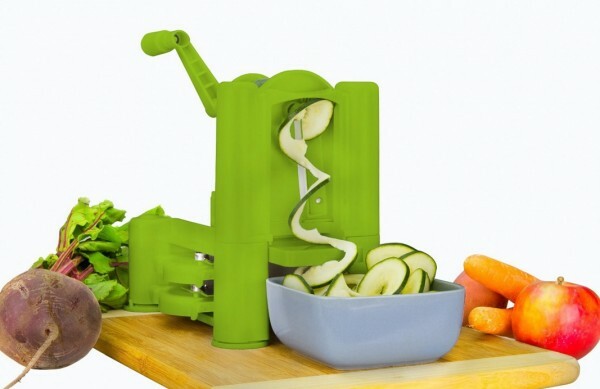 The Brieftons tri-blade vegetable spiralizer includes an angel hair blade, a spaghetti blade, and a flat blade – a versatile combination. Brieftons claim to fame is their lifetime “heaviest and sturdiest” guarantee. Not a big fan of knives? 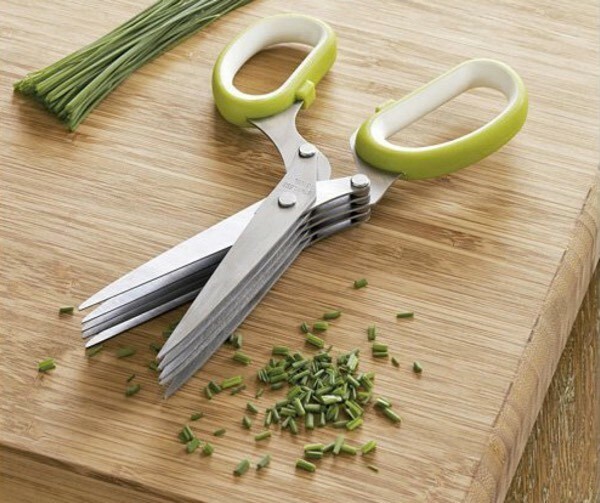 Herb scissors make it easy to snip herbs evenly and with little effort. Get a perfect 1/2 teaspoon of sugar with each push of a button. 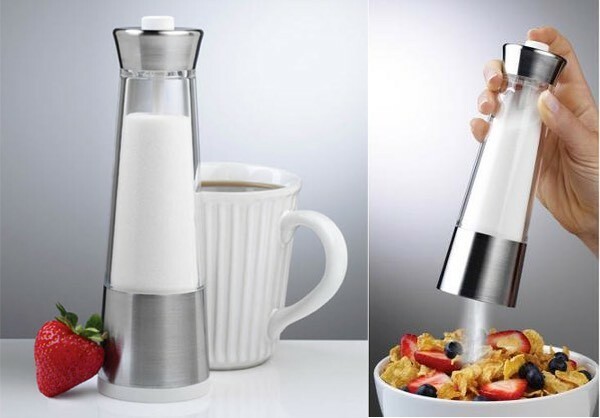 This automatic sugar dispenser would be a great way to track sugar consumption without the hassle of measuring spoons. Could a ladle get any cuter? 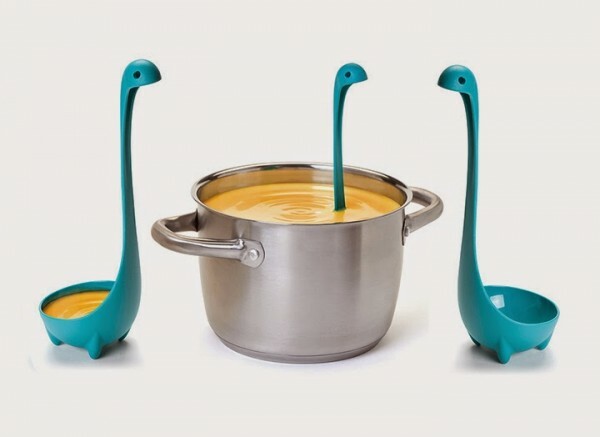 These colorful Loch Ness monster utensils stand upright in pots and brighten the room. 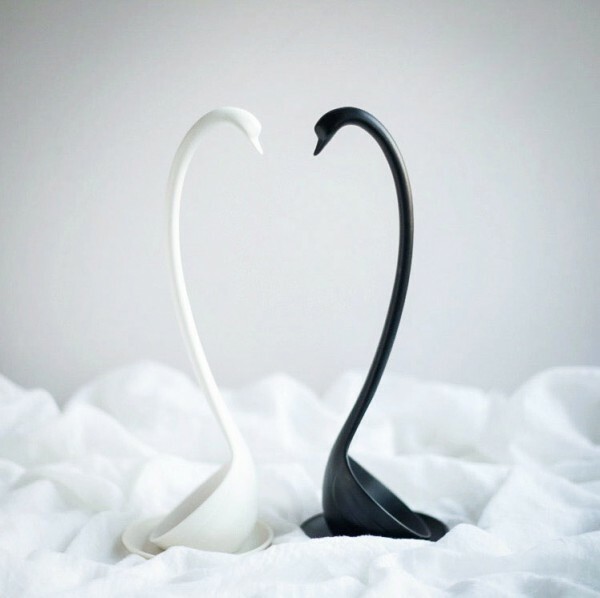 These swan-shaped ladles would be great for serving up punch at a wedding or anniversary party. 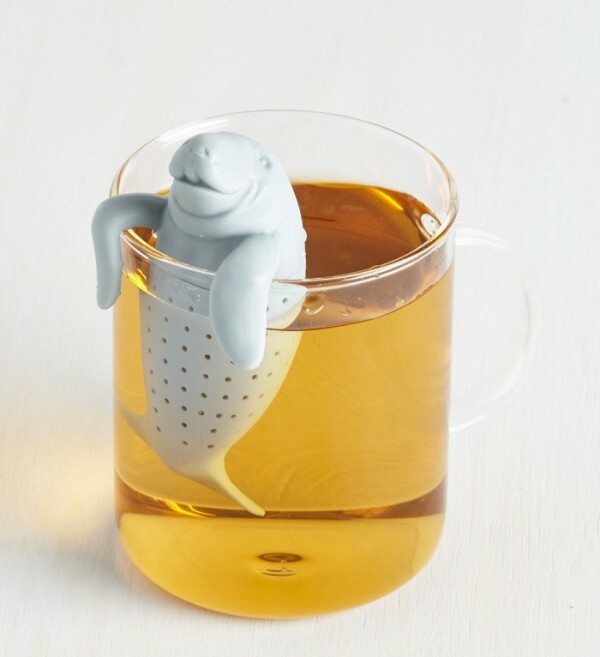 This cheerful little manatee perches on the edge of a cup to serve as a convenient and personable tea infuser. A space-saving nesting kitchenware set with everything a casual baker could need to whip up a tasty meal in no time. 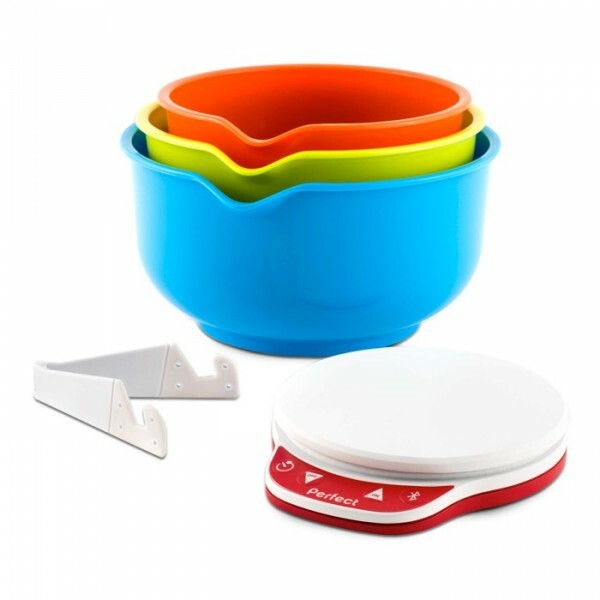 This 9 piece set comes with two mixing bowls, a stainless steel colander, a stainless steel sieve, and a collection of measuring cups and spoons. 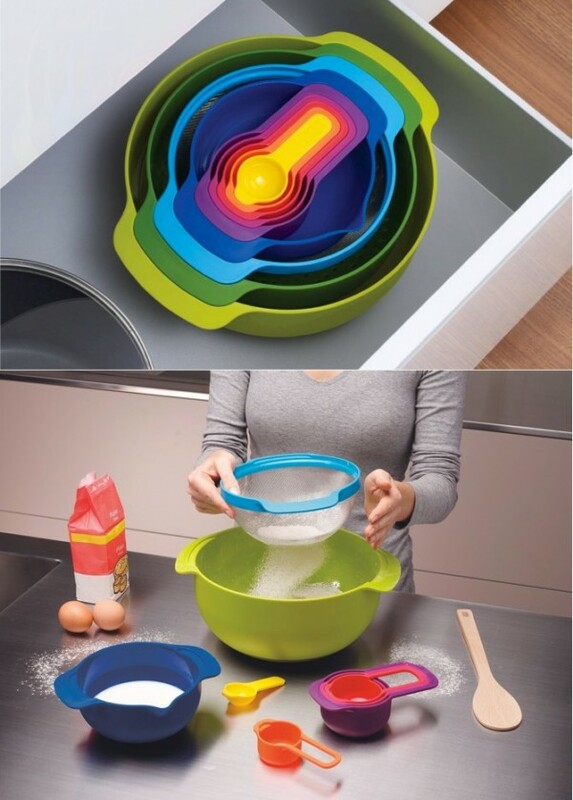 The smaller mixing bowl has a spout and built-in measurements to speed up the prep process. Just too perfect! 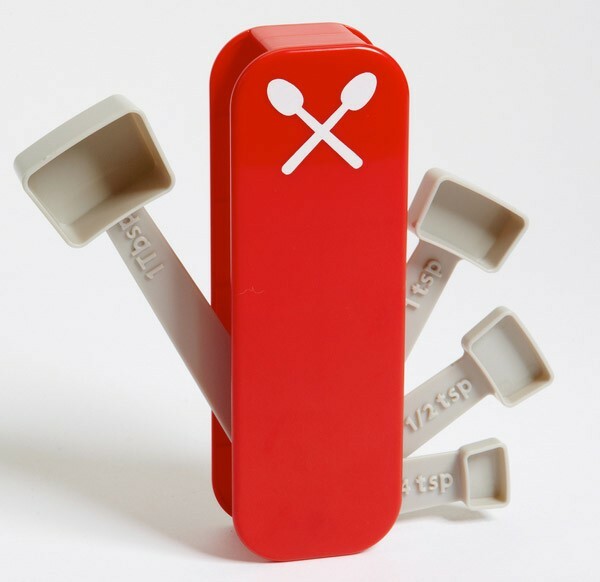 This little Swiss knife style measuring spoon set would make a great gift or a fun talking point in the kitchen. 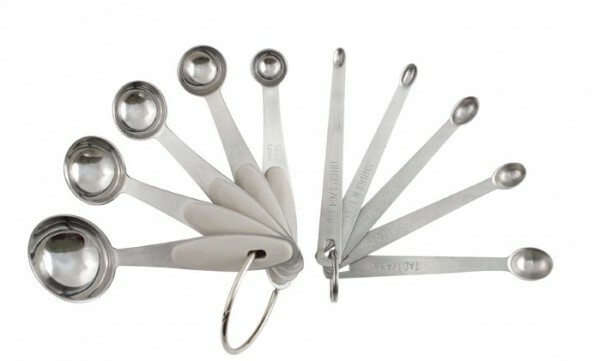 This ten piece measuring spoon set is made of stainless steel with engraved measurements – built to last. The smaller ring includes small fractional measurements, playfully marked with their more casual equivalents like drop, smidge, and tad. A scale measuring spoon that gives volume as well as weight, reading accurately to 10 ounces or 283 grams. 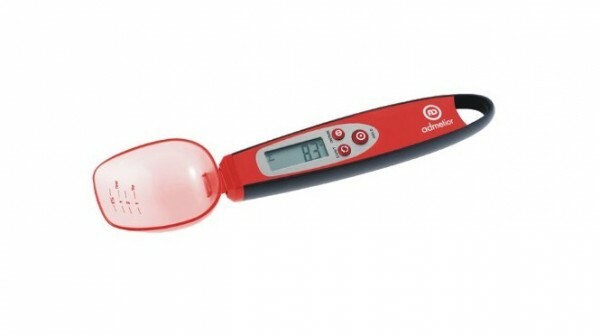 The automatic accumulative measurement feature even keeps track of recurring spoonfuls. 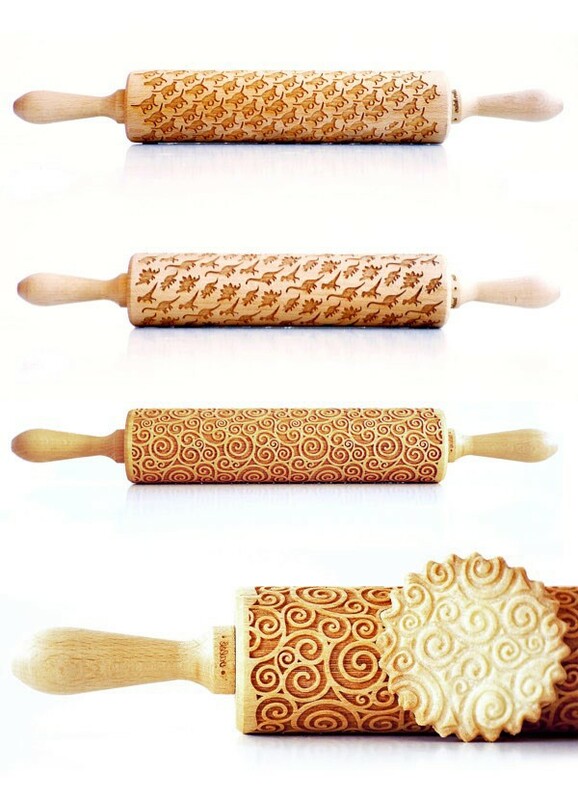 Laser engraved rolling pins by Zuzia Kozerska make it easy to create beautiful cookie patterns while you roll out the dough. There’s a pattern out there for anybody: damask, dinosaurs, snowflakes, teacups, and so many more. They even make kid sizes so the little ones can have fun helping. Build a cool display or just play with your food… it’s up to you. 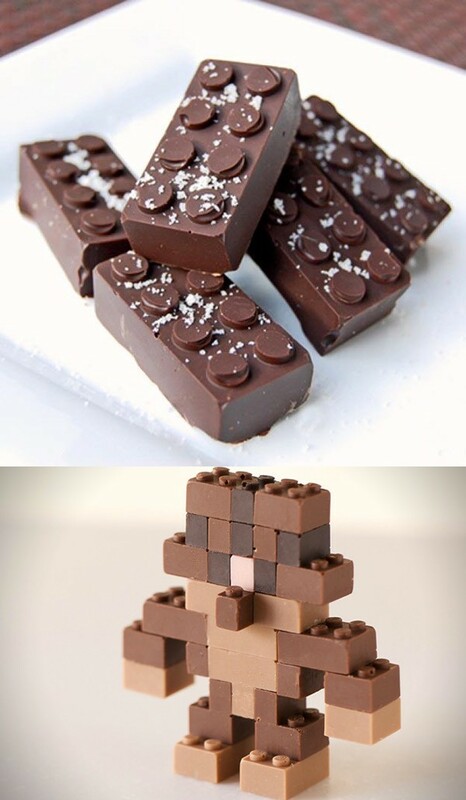 These LEGO molds are great for chocolate, ice cubes, or even homemade soaps and crayons! 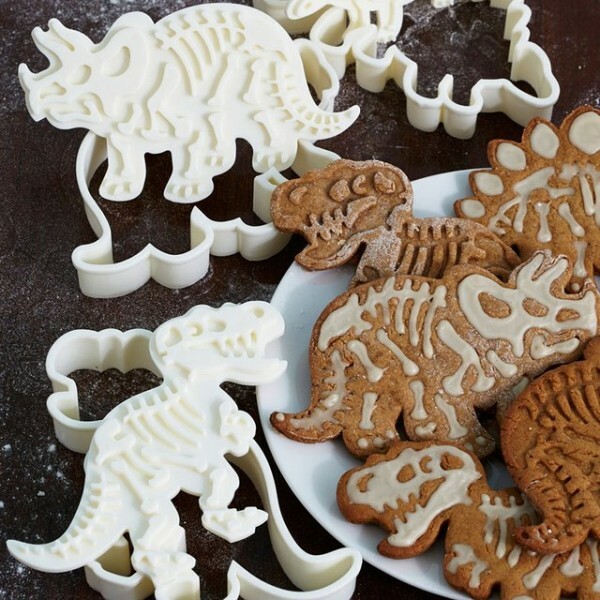 This dinosaur fossil cookie cutter and embosser kit creates divots where the bones should be. They look awesome with or without added frosting. These cookie cutters would make a great gift for a parent, teacher, or archaeology enthusiast. 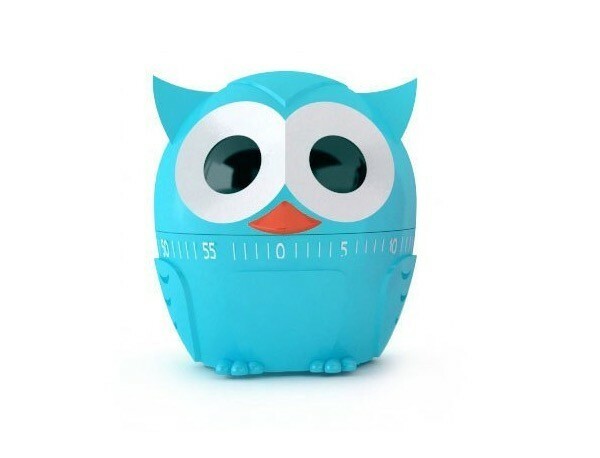 Kikkerland’s cheerful Owlet kitchen timer will let you know when it’s time to check the oven. 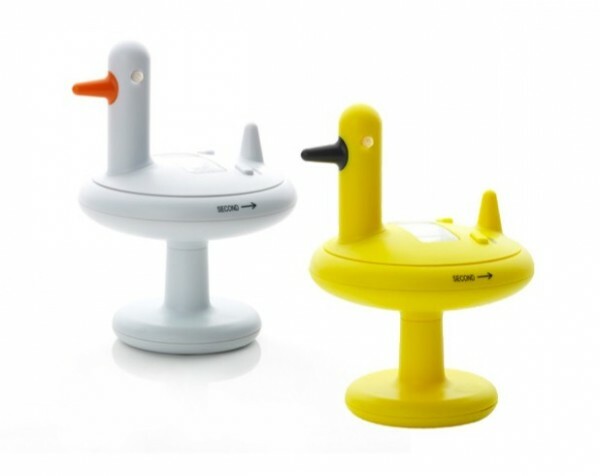 Guests are sure to notice this unique and playful kitchen timer by renowned mid-century designer Eero Aarnio – creator of the iconic Ball Chair. 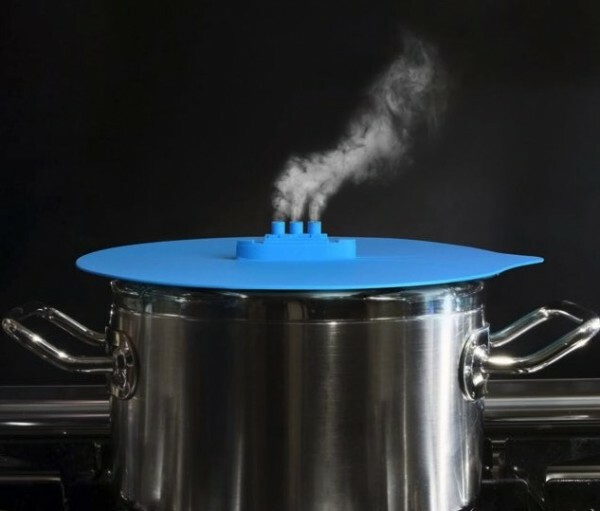 Fred and Friends designed a clever ship-inspired steamer lid that prevents boiling over while trapping the majority of the moisture and flavor inside the pan. 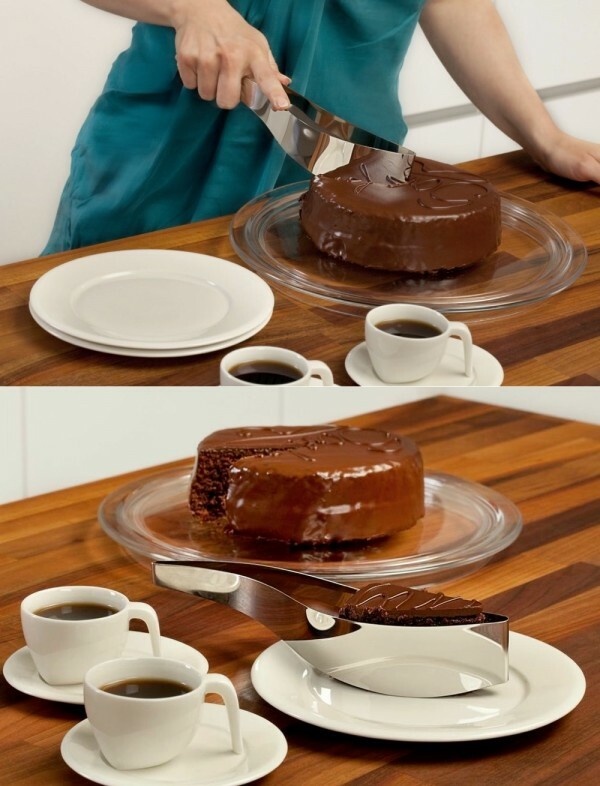 Get perfect slices every time without dirtying up additional utensils with this cool tong-style cake slicer. 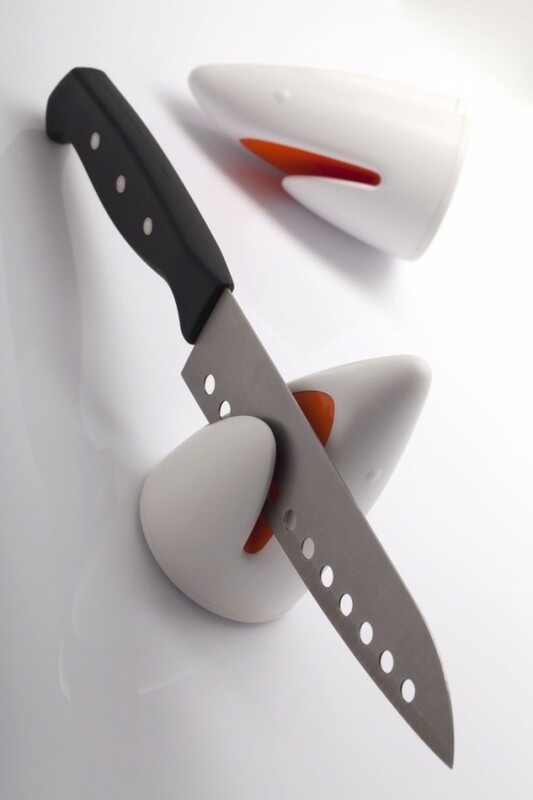 Perhaps not the most practical design for a serious chef, but it sure does look impressive – the nesting nonstick knife set from Deglon would make a nice display piece and conversation starter in any kitchen. Do check out our post on unique knives for more cool knives. 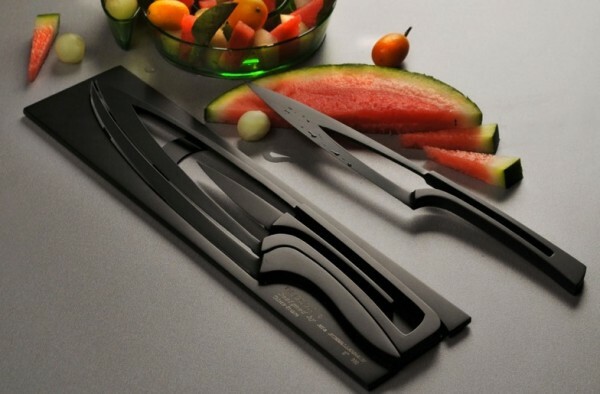 This shark-shaped knife sharpener would make any aspiring chef feel pretty tough. 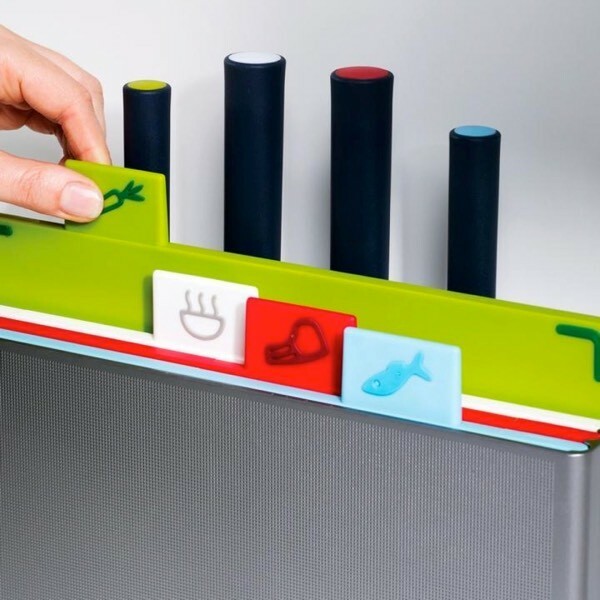 Four color-coded chopping boards and four coordinating knives slide right in to a convenient and streamlined storage block. This set is nice for chopping small quantities or preparing food in kitchens with limited space, but it’s also available in larger sizes too. 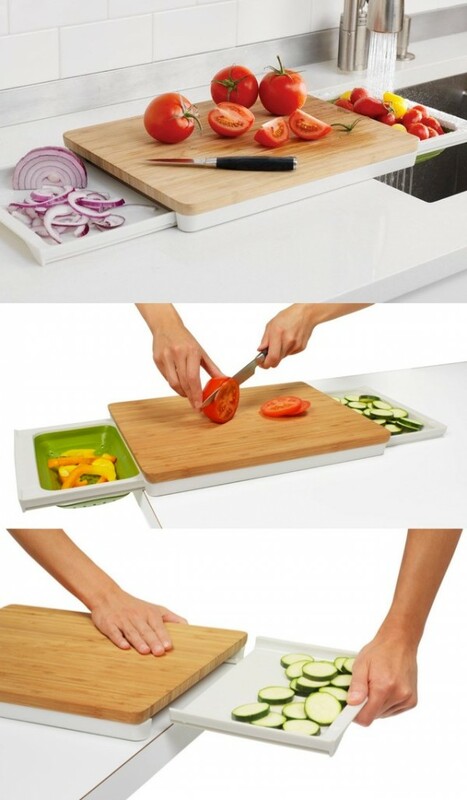 Rinse, cut, and carry with this multipurpose chopping block. 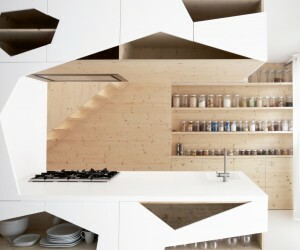 Short on storage space? 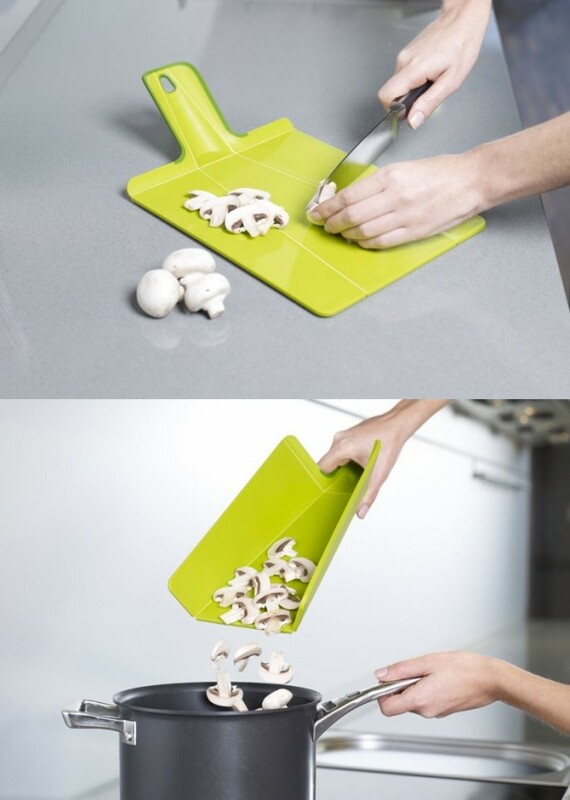 This folding chopping board is streamlined and functional, making it easier to transport ingredients for use. Over-sink cutting boards are a great way to add more prep area to a kitchen with limited counter space. 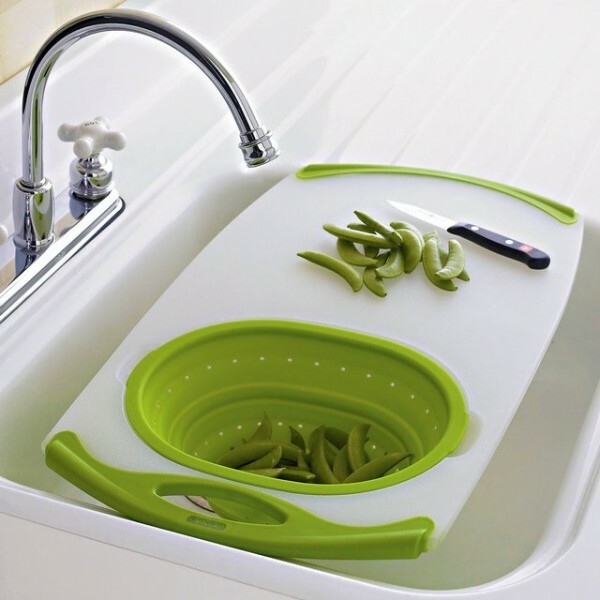 This one includes an expandable colander for easy rinsing. 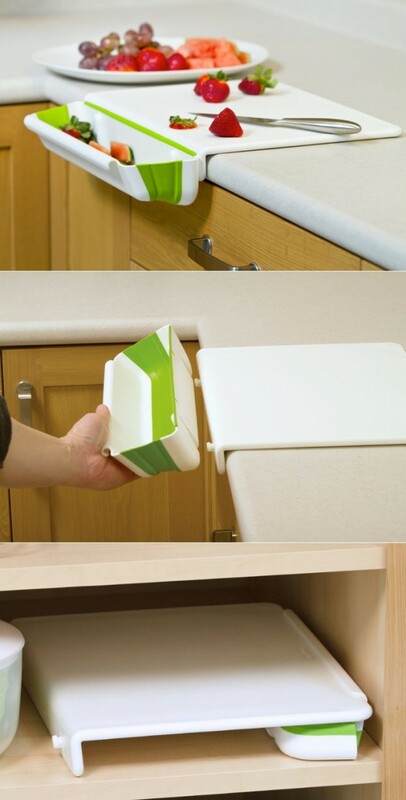 Another nice cutting board with a scrap container – these are always a great housewarming gift. Kitchen sanitation is a huge concern, and this soap dispenser design aims to keep sticky ingredients off the dispenser so home chefs can feel confident using it after even the messiest recipes. Save time by cutting a few rounds of chopping from your next recipe with whole herbs! 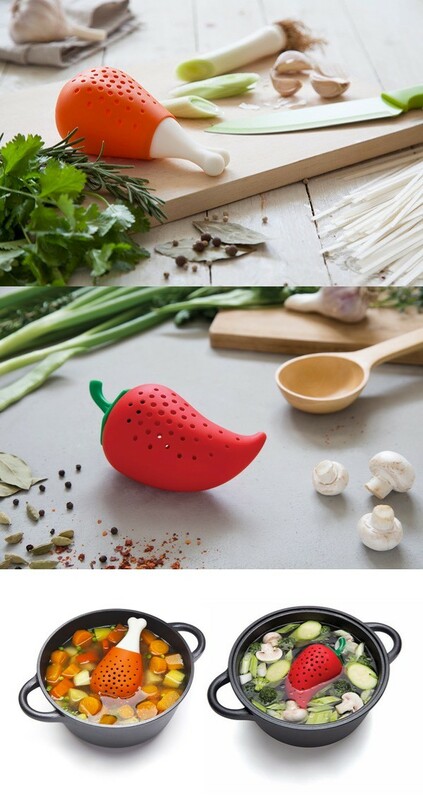 These fun herb and spice diffusers will infuse your stocks and soups with whole herbs without leaving any evidence behind. 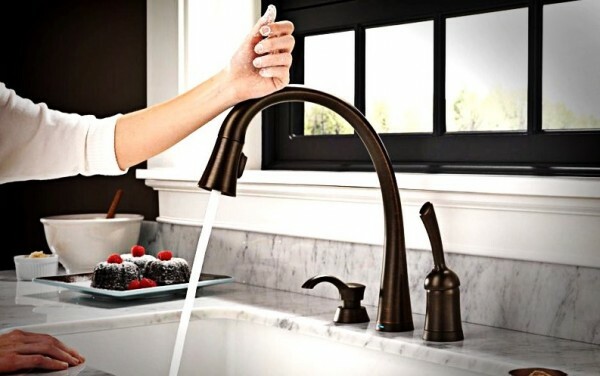 Touch-sensing faucets are hygienic and convenient even with dirty hands or while holding a heavy pot. 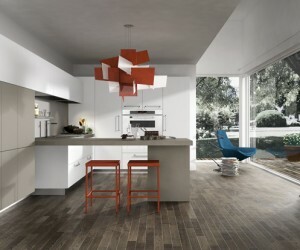 This model from Delta offers the best of quality, dependability, and beauty. 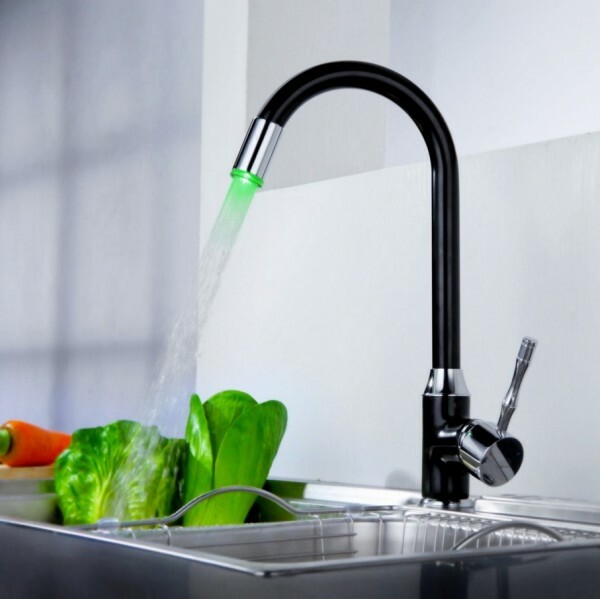 This faucet comes with an LED that changes with the temperature of the water – a fantastic safety feature for kids and anyone with high or low sensitivity to temperature, and a nice way for anyone to get the perfect temperature without wetting the hand to test it. 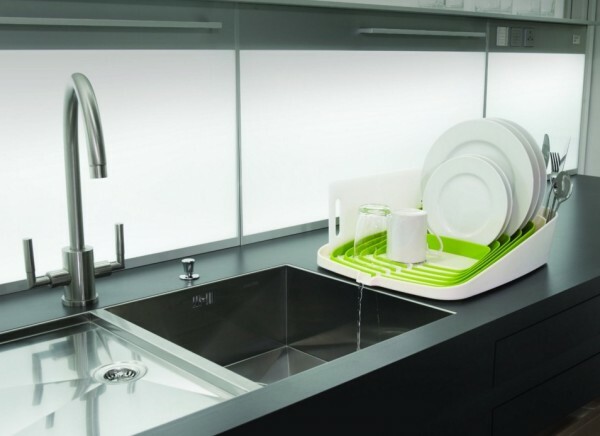 Finally, a sleek and stylish dish rack you wouldn’t mind seeing on the countertop. 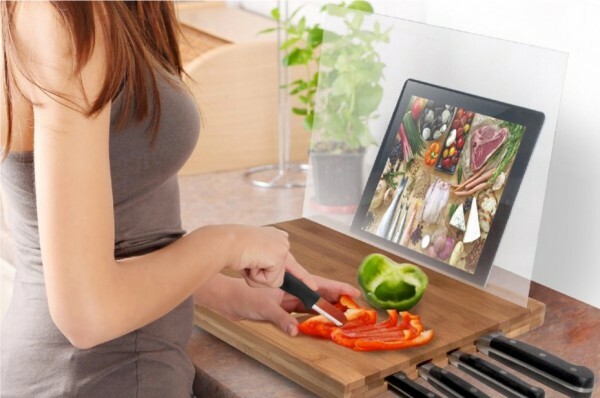 This clever cutting board includes a tablet stand a handy splash guard to protect it from flecks of veggie juice. It also doubles as a knife block so you can keep your eyes on the cooking tutorial playing on the tablet screen. 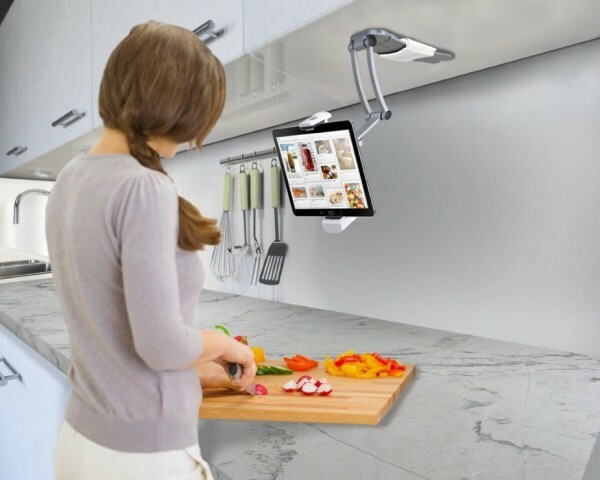 Another great item for anyone who likes to follow along with recipes online – this adjustable tablet mount keeps the tablet off the countertop and closer to eye level, or wherever you may need it. Add a fun touch of luxury to your drinks with this gem-shaped silicone ice cube tray, fun for themed parties or stylish cocktails. Need an excuse to have Star Wars decor in your kitchen? This officially-licensed Darth Vader toaster would make a great gift for any collector or longtime fan. 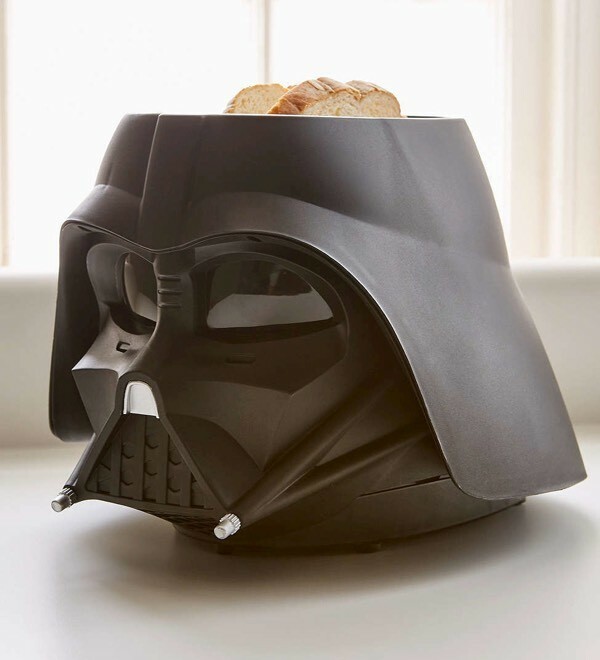 A unique heating element toasts the Star Wars logo into the side of the bread to make breakfast extra fun. Includes defrost and quick-stop features. Way too cute! The Breakfast Express Set links together with hidden magnets so it can chug along in its duty to deliver egg, toast, and spices right to your plate. 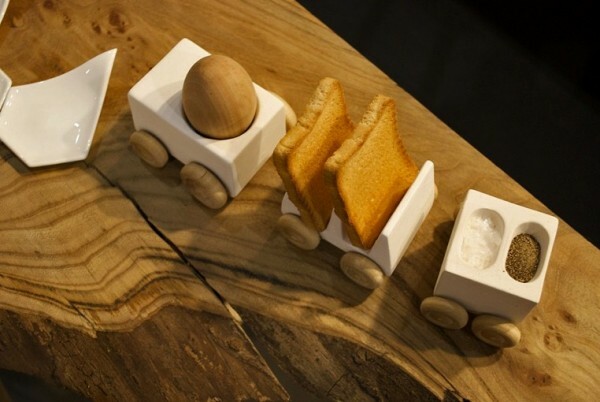 If you have trouble motivating the kids to eat breakfast in the morning, this fun train set just might have the solution. 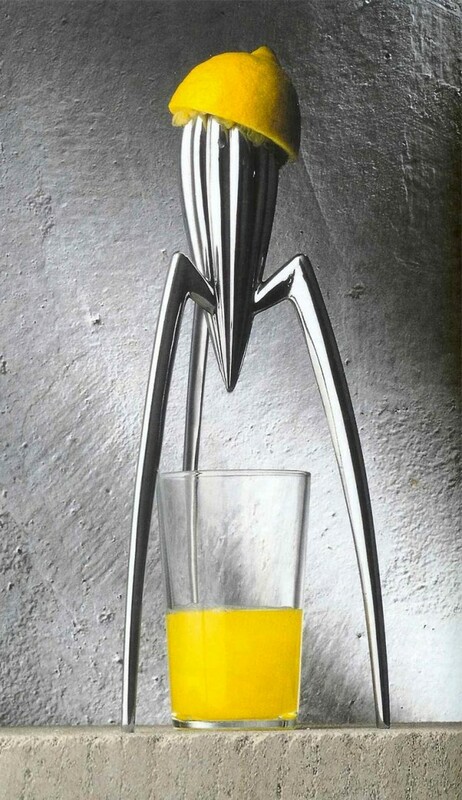 Philippe Starck created this sculptural juicer for serious design fans who value form but won’t compromise on function. It’s artwork for the countertop. 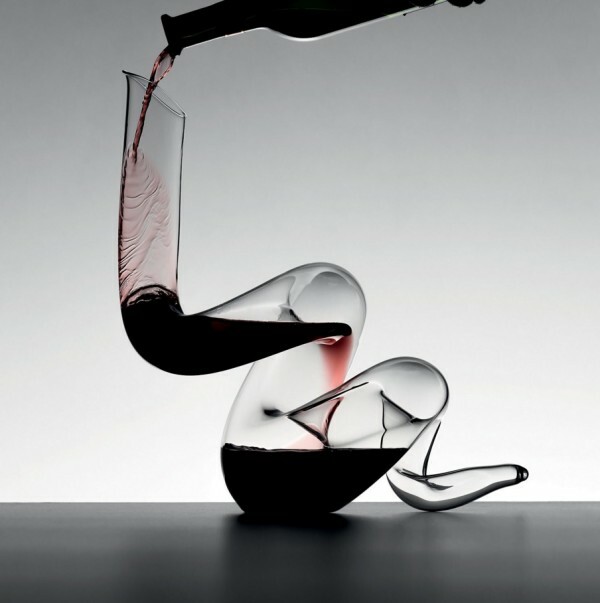 This mouth-blown crystal decanter is an absolute show-stopper with its gorgeous and balanced spiral shape. But it’s not just a statement piece or talking point – it double decants its contents to more effectively open the flavor and aroma of young wines, a feature sure to please even the most informed connoisseur. 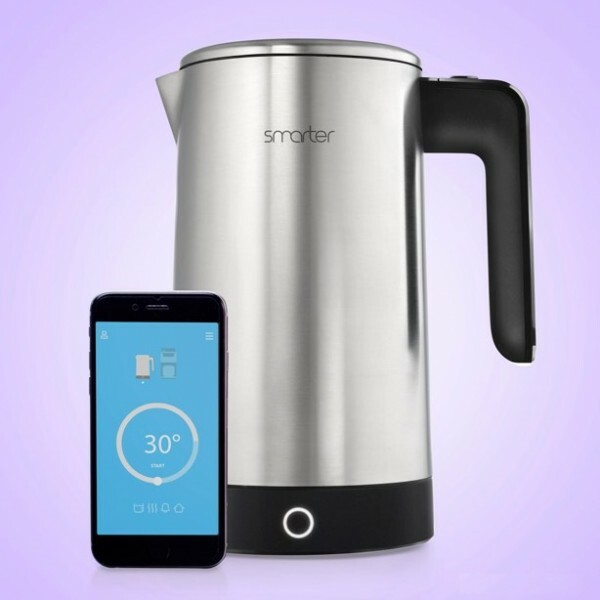 Fans of connected devices are sure to love this smartphone-controlled smart kettle. 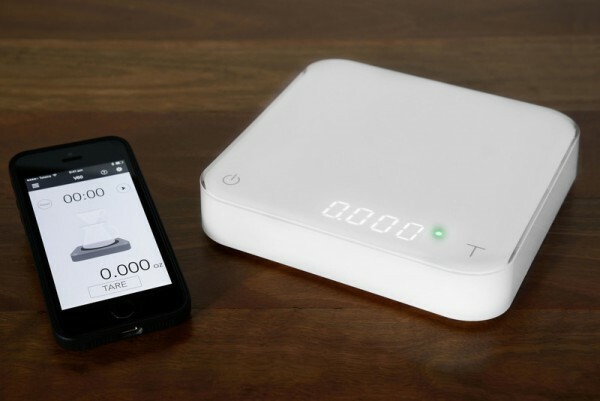 Use the app to set the temperature anywhere between 20-100c, and start heating water from anywhere in the house. Wake Up and Welcome Home modes automatically prompt so you don’t forget to set the kettle on and easy scheduling means you’ll be able to have a hot brew ready right when you need it. Auto shutoff prevents dry-boiling mishaps for even the most forgetful user. 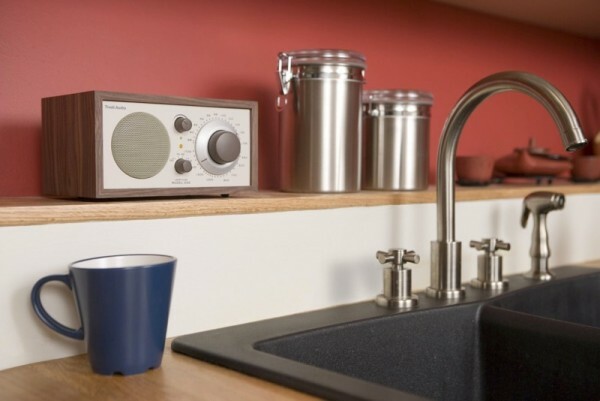 What could be a better way to perk up your kitchen routine than with this classic style Tivoli radio? 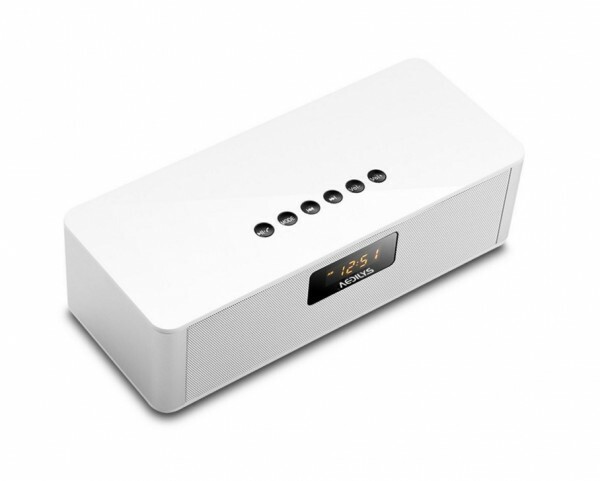 Behind that charming facade lies an advanced piece of technology with ultra-fine AM/FM tuning in addition to Bluetooth capabilities to play music from a smartphone or mp3 player. 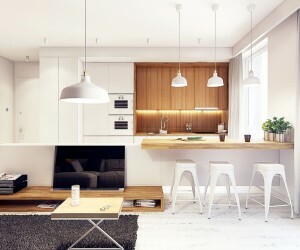 For those who would like a more modern look for the ultimate minimalistic kitchen, this AEDILYS portable radio system is sure to fit the bill. This nice little radio has a powerful sound and works through Bluetooth, USB, micro SD, and more. And of course the clock comes in handy too! 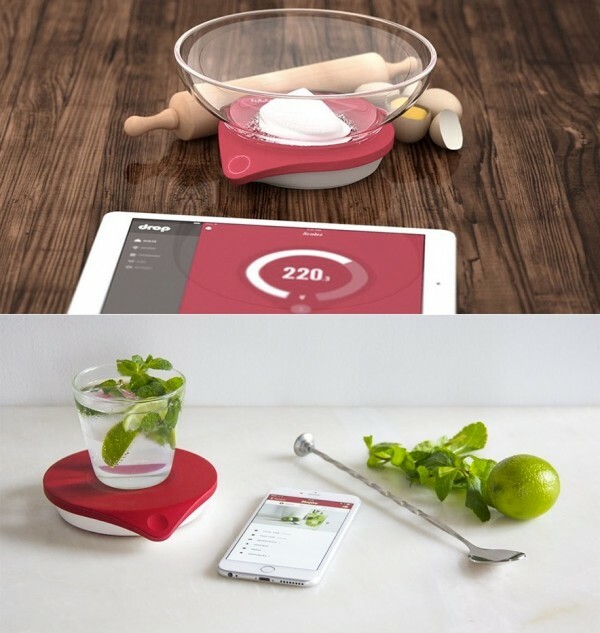 The delightfully techy Drop Kitchen scale offers an easy and convenient way to progressively measure ingredients without dirtying up too many bowls or spoons. The official Drop Kitchen iOS app even offers hundreds of interactive recipes to help even the most inexperienced novice whip up impressive meals to perfection, and allows automatic recipe adjustment on the fly for those who aren’t big fans of math. Don’t have an Apple device? Here’s an Android-compatible smart scale to get measurements spot-on every time. This incredibly sensitive coffee scale for iOS and Android will help serious coffee nerds keep track of ratios and weight throughout the brewing process. Monitor flow rates, track times with the stopwatch, and work your way toward a consistent cup every time. Good-looking coffee makers are like unicorns – very hard to find! 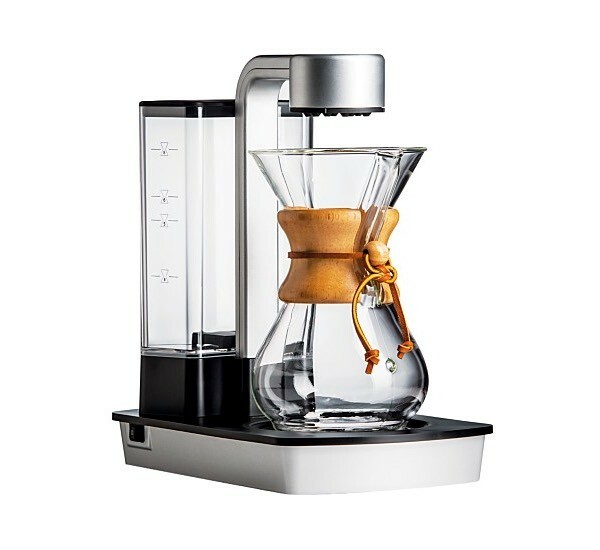 This elegant Chemex Ottomatic coffee and tea maker delivers top quality brews for people who demand inscrutable style in the kitchen. Note the spray head for even extraction. 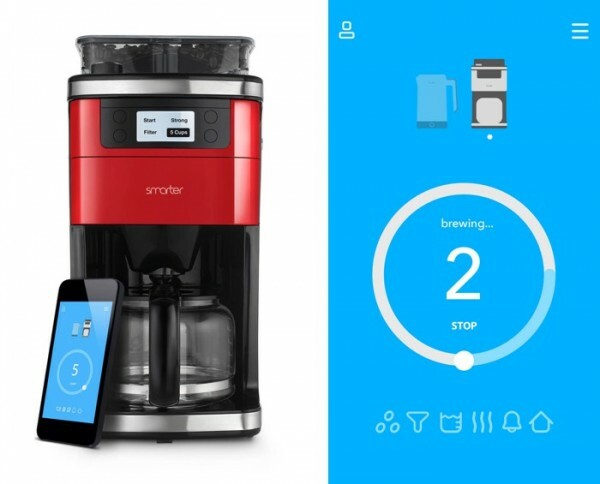 Timers, scheduling, coffee strength adjustments, built-in water level sensors… The Smarter Coffee machine is the ideal brewer for people who want the best of both fine-tuned precision and absolute convenience. Grinds and brews automatically, but works with pre-ground beans too!